As I’ve said before, Randy and I have a goal to visit all 50 states in the nation. We’ve gotten all states west of the Mississippi River, including Alaska and Hawaii, plus New York and Florida. We’re getting close to meeting our goal. Because of cancer care the last few years, our vacation plans have been put on the back burner. In fact, Randy earned an all-expenses-paid trip to Aruba that we had to turn down! We currently have two different trips mapped out: North East and South East. One day soon we’ll take them! While my husband looks forward to the seafood options in Maryland and Maine, I can’t help but look forward to the sights and tastes of New Orleans. I have always been fascinated with the culture of that state. (Hence my many Mardi Gras cookie dough ball, beaded mystery mask, statement necklace, and cinnamon roll money bread recipe, among others.) Don’t get me started on how much my anticipation increased after Disney released The Princess and the Frog! If pressed, I guess you could say my current dream vacation would be to New Orleans. 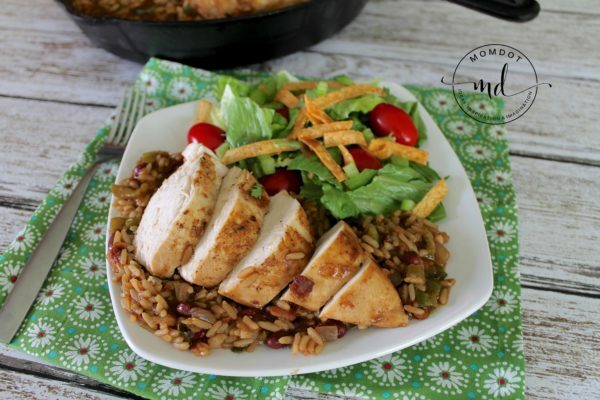 For another one-pot chicken meal, I recommend my Cilantro Lime Chicken Skillet with Black Beans and Rice! The Holy Trinity: “Cajun Holy Trinity consists of onions, bell peppers, and celery, the base for much of the cooking in the regional cuisines of Louisiana. Typically equal measures of the three ingredients or two parts onion, with one part celery and one part green bell peppers.” Who wouldn’t dream of tasting flavors that include “Holy” combinations?! Chop up your onion, celery, and green pepper. Because my children can find every single little transparent, cooked onion, I chopped mine very fine, so that they could easily be lost in the seasoned rice. Helpful Tip: When purchasing your green bell pepper, purchase one that has only three bumps on the bottom. I’ve learned that four bumps is a “female” bell pepper. Female peppers are full of seeds, but are sweeter (obviously!) and better for eating raw. Three bumps on the bottom means it is “male,” with far fewer seeds, and better flavors for cooking. Helpful Tip: When chopping your onion, you could either wear a pair of swim goggles, or hold a match (tip out) between your teeth, to reduce the tears and snail trails from leaking down your face. Season chicken breasts on both sides with approximately 2 teaspoons of Cajun seasoning. Drizzle a large skillet with 2 Tbsp. olive oil and cook chicken breasts for approximately 1 minute on each side, just enough to brown each side, over medium-high heat. Transfer to a plate while you combine remaining ingredients in skillet. Yes, it still looks raw, and yes, it will be fully cooked by dinner time. Reduce heat to medium-low. Add chicken broth, Zatarain’s Family Size Red Beans & Rice Dinner Mix, onion, celery, green pepper, and remaining 2-3 teaspoons of your Cajun seasoning. Helpful Tip: This is where you can customize your meal. To control the spiciness, add more or less of the seasoning. Because I didn’t really know how I like mine, I dumped the remainder that I hand’t used to season my raw chicken breasts and hoped I would love it as much as I dreamed I would. Also, if you love Cajun as much as I’m learning to, try my Cajun Chicken Caesar Salad! I realize that the instructions for the Zatarain’s Red Beans & Rice Dinner Mix calls for 4 1/2 cups of water, but the additional moisture from the chicken breasts will make this meal feel more like a gumbo if you use the 4 1/2 cups, which, honestly, would be another incredible meal! For this meal, however, stick with only 3 1/2 cups chicken broth, to give the bed of rice that perfect, tender texture. 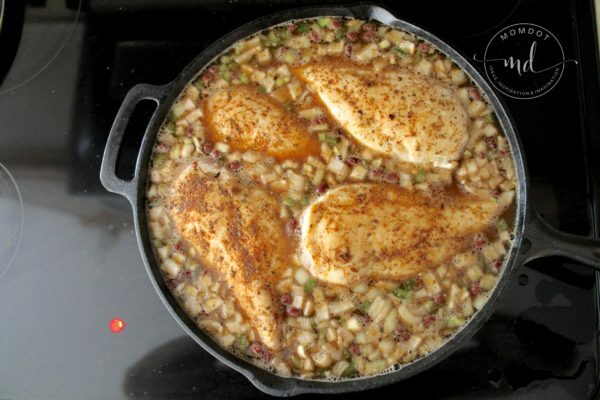 Return your browned chicken to the skillet, placing evenly spaced on top of the rice mixture. Cover with a lid and simmer over that medium-low heat for 20-25 minutes, stirring occasionally to prevent rice and beans from sticking. Just as I explained here, I checked my chicken with a thermometer to make sure they were fully cooked to 165 degrees Fahrenheit. While it cooked, I turned on The Princess and the Frog, inspired by the music, channeling my best Tiana while creating food for the masses, failing miserably at my accent. Depending on which child you ask, it was either incredibly endearing or embarrassing, my New Aw-lins essence. But they loved dinner, so I call it all a resounding success! Season chicken breasts on both sides with approximately 2 tsp. Cajun seasoning. Drizzle large skillet with 2 Tbsp. olive oil and cook each chicken breast on each side over medium-high heat for approximately 1 minute, enough to brown each side only. Transfer to a plate while you combine remaining ingredients in the skillet. Yes, the chicken is still raw, and yes, it will be cooked through for dinner time. Reduce heat to medium-low and add chicken broth, Zatarain's Family Size Red Beans & Rice Dinner Mix, onions, celery, green peppers, and remaining *2-3 tsp. Cajun seasoning. Stir to combine. *This is where you can customize your meal. To control spiciness, add as little or all of the remaining seasoning. 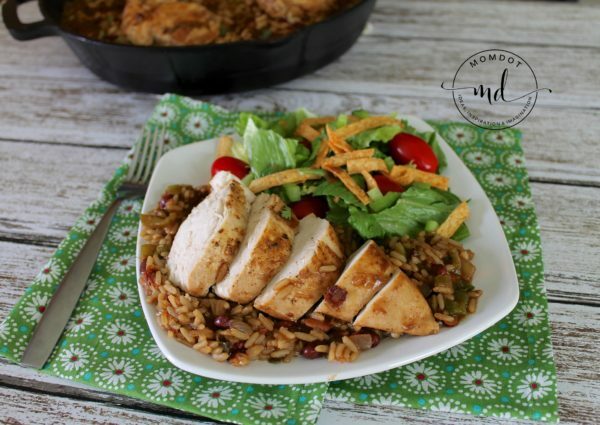 Return browned chicken breasts to the skillet, evenly spacing each breast atop the rice mixture. 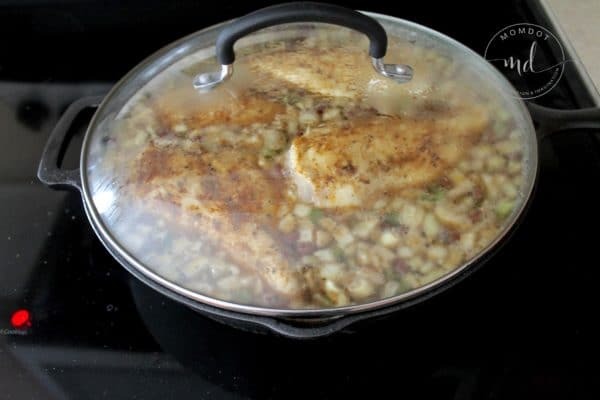 Cover skillet with lid and simmer over that medium-low heat for 20-25 minutes, or until liquid is absorbed and chicken is cooked through to 165 degrees. Sprinkle with optional chopped parsley and serve. I cannot wait until I can compare my own flavors to those from the beautiful state of Louisiana. Until then, I’m going to continue to dabble in Southern charm and cookery.